← The Sports Archives – Clyde Wetsuits – The Wreck Of The MV Akka! The Sports Archives – The Top Three Golf Comedy Movies Of The Last 20 Years! Some of the most well-known golf movies released more recently have been dramas, such as The Legend of Baggervance and The Greatest Game Ever Played. But if you prefer a more lighthearted look at the game, the comedy genre has offered up some films worth a look. These are the mainstream movies. There have been some recent indie film offerings in this niche as well, but finding sufficient information for those films, let alone a copy of one to watch, proved difficult. So here are my suggestions, in no particular order. 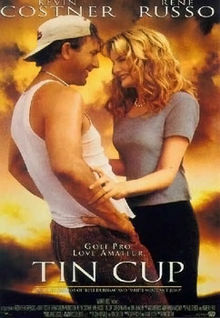 One of the best known and most enjoyable films in the comedy niche is the 1996 romantic comedy Tin Cup. Kevin Costner stars as washed up golf pro Roy McAvoy who falls in love with the girlfriend (played by Renee Russo) of his arch rival David Simms (played by Don Johnson). Costner’s character ends up revitalizing his golf career and challenging his rival in the US Open while trying to win the girlfriend’s heart. The always entertaining Cheech Marin also co-stars as Costner’s friend and caddy. Being a romantic comedy, it can be a little predictable at parts, but it’s entertaining anyway. This is generally considered by many to be one of Kevin Costner’s best performances. Okay, this one is probably going to start an argument. This movie stars Antwan Andre “Big Boi” Patton as rapper C-Note who is trying to get a membership at an exclusive country club. When met with opposition, he and his entourage decide to make some mischief. The premise is largely a rip off of Caddyshack, and the humor is really juvenile. It’s not one of the all-time great movies, but there are definitely worse than this. If your sense of humor tends toward the goofy and stupid, this movie could be reasonably enjoyable, probably with the addition of a good amount of your favorite alcoholic beverage. 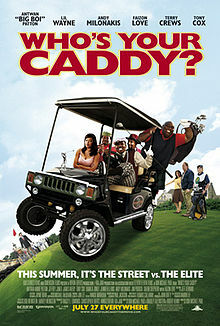 And for golfers there may be some humor value in what is clearly a lack of skill and knowledge about the game itself (Big Boi admits to not having golfed prior to making this movie). Kind of a “so-bad-it’s-funny” sort of thing. Big Boi manages to make his character likeable, at least there are a few chuckles in this movie, and the actors look like they’re having fun. That more than can be said for Foursome (2006), which got better reviews. 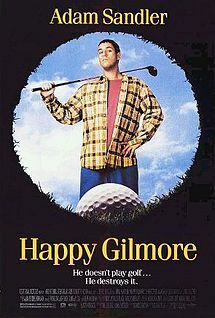 Always up toward the top of anyone’s list of golf comedies is Happy Gilmore. Often regarded as Adam Sandler’s best movie, he’s a wannabe hockey player who finds out he has a talent for hitting a golf ball really far. He then proceeds to start golfing to earn money to save his grandma’s house. Happy joins the pro tour, his temper gets him in trouble and he becomes the newest golf sensation, much to the dismay of his arch-enemy Shooter McGavin. Of course, the scene with Happy and game show host Bob Barker getting in a fight is a classic. It’s a funny, feel good movie with a happy ending. What’s not to like? As a final thought to all the screenwriters and directors out there, notice two of the movies mentioned are from 1996. It has been a while since we’ve had a truly great golf comedy. This niche has a lot of potential and hopefully someone will take advantage of that soon. We are all anxiously awaiting the next golf comedy classic. Jennifer is a professional writer working with Radical Golf Carts. She enjoys writing opinion editorials and research-based pieces. Relaxing On The Fairway Between Shoots – Hollywood Movie Stars Who Love To Play Golf! That Good, Old Game Of Golf! Golf in 2013: A Year in Review! This entry was posted in Golf and tagged Adam Sandler, Antwan Andre "Big Boi" Patton, Bob Barker, Caddyshack, Cheech Marin, comedy, comedy movies, David Simms, Don Johnson, film, Foursome, golf, Golf Blogs, golf movies, golf romantic comedy, golfers, golfing, Happy Gilmore, Kevin Costner, movies, Renee Russo, Roy McAvoy, Shooter McGavin, sports and leisure, Sports Archives, Sports Blogs, The Greatest Game Ever Played, The Legend of Baggervance, Tin Cup, US Open, Who's your Caddy?. Bookmark the permalink.